One of America’s most beloved Country Music Entertainers is pictured on the front cover in a familiar pose. It’s Brother Oswald himself entertaining with Roy Acuff’s Smokey Mountain Boys on the stage of the Ryman Auditorium in Nashville, Tennessee during a performance of the Grand Ole Opry. 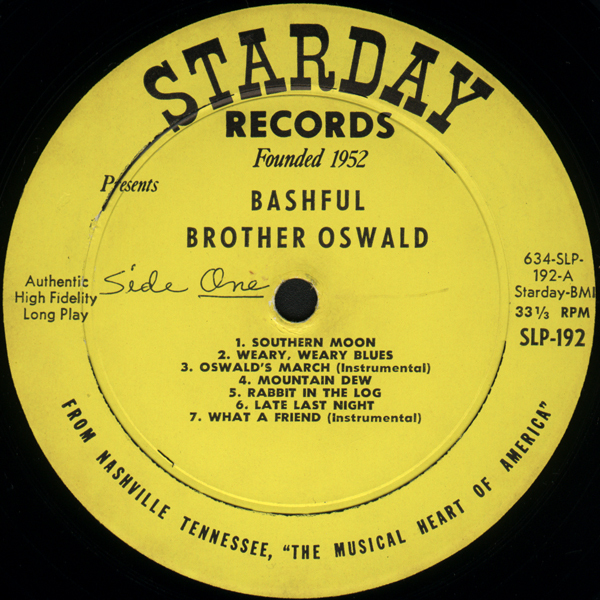 At long last, the pickin’, singin’ and good humor of Bashful Brother Oswald has been captured on records. 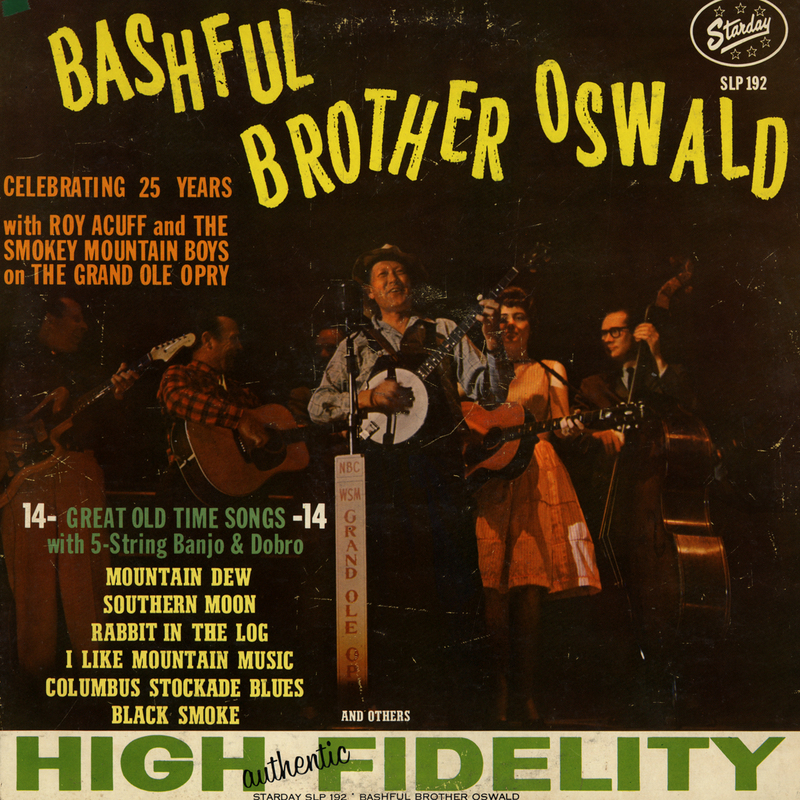 Folks who enjoy and appreciate real, honest to goodness country entertainment, are in for a treat when they hear the remarkable collection of old time favorites done up in traditional mountain style by Brother Oswald accompanied by Roy Acuff’s internationally famous Smokey Mountain Boys. For 25 years Os has been a featured performer with the Roy Acuff Show. In fact he has only missed two shows in all of that period, and he never has been late for a show. This means that millions of Americans have seen and heard this fabulous entertainer on stage and on television. And in recent years, with Roy Acuff’s band playing for American Armed Forces throughout the world, the antics, clowning, fun, plus the music of Bashful Brother Oswald has spread to the far corners of the earth. And millions more have seen and enjoyed Os in the several movies that he made with Roy Acuff also. “Brother Oswald is much more than a valued member of my Smokey Mountain Boys. We enjoy the kind of friendship that comes from years of traveling and playing the only kind of music that we love and understand, and that’s ‘real Country Music’. Although known to millions as Bashful Brother Oswald, the real name is Pete Kirby, and he was born and raised in Sevierville, which is in Eastern Tennessee’s Smoky Mountains area near where I was born and raised. The name Brother Os seems to reflect the down home country personality of this remarkable entertainer and I’m afraid he’s stuck with it for life. 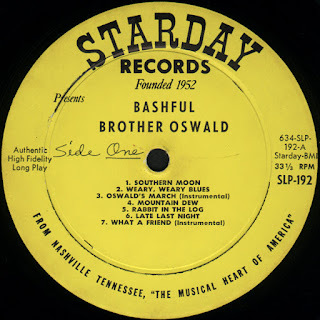 Oswald’s dad was a barber and a farmer but he also played a fiddle and a 5-string banjo and these talents were passed on to Brother Os at an early age. Oswald started working in a saw mill, but his heart was with country music. He played and sang at house parties for the mountain people in East Tennessee and in those days the pay amounted to whatever was collected by passing the hat around after the performance. When only 18 years of age, Oswald left Sevierville and went to Flint, Michigan where he worked with several country music groups. It wasn’t long before he was lonesome for the Tennessee Mountains so he journeyed back down south and got a job in a bakery in Knoxville. I first met Os in 1938 when he performed with my band at a house party and he has been with me ever since. I’ve never stopped to figure it out, but I figure we’ve traveled over a million miles together during the last 25 years and we have had many good times together. There is a certain comradeship that develops between country music entertainers who must be on the road a great deal of the time, travelling during all kinds of weather, having to meet tight schedules, and trying always to put on the kind of a country music show that will reflect credit and make friends for our kind of music. 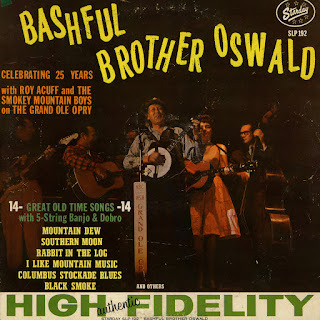 The loyalty, friendship, and entertainment ability of Bashful Brother Oswald has always set an example for the members of the Smokey Mountain Boys band. These recordings were made at the Starday Sound Studios in Nashville, Tennessee. Recording engineer was Tommy Hill. Recordings were made in Stereo and re-mixed for maximum monaural sound quality. Accompanying musicians were Howdy Forrester on fiddle, Jimmy Riddle on harmonica, Junior Huskey played bass, the great Cowboy Copas played open string Martin Guitar, and Brother Oswald played 5-string banjo on most of the songs. In addition there are 4 dobro instrumentals by Os. Throughout the album the listener will notice the genuine good humor that prevailed during the relaxed atmosphere of the recording sessions. Os carried on in his usual style, just like he was on stage, and the musicians joined in the fun as they picked and sang the great old favorites. This is another special country music presentation by Starday Records, a label devoted exclusively to authentic Country and Gospel Music.